or just plain mat board. Please enter the Names & Date into the respective boxes above. 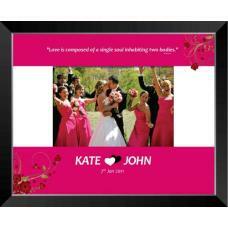 Names & Date will be printed directly onto the Mat Border surrounding your photograph. If you don't want a name or date just leave the boxes blank. We can print and insert the photograph for you or you can order the frame empty to insert your own photograph. Can be used as a Guestbook Frame. Please choose open - turnbuttons for easy removal and image insertion. Choose taped and sealed for permanent fitting of picture into frame. Write your own message or we will print the one above.